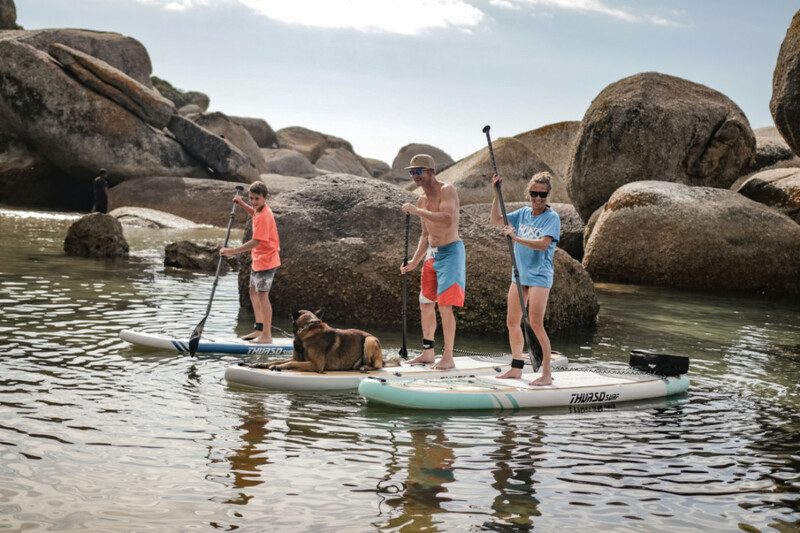 We’re kicking off 2019 with updates across our whole stand up paddle board lineup! Our SUPs have been put to the test all over the world and they’re ready to carry you into a whole new year Exploring the Beyond! Before we dig into the details, we headed down to South Africa with the whole lineup to get some sweet footage so you could see what the new gear is all about . Check it out! The Waterwalker, our unique all-round board, is a blend of a touring shape with an all-round contour to give you the best of both worlds. 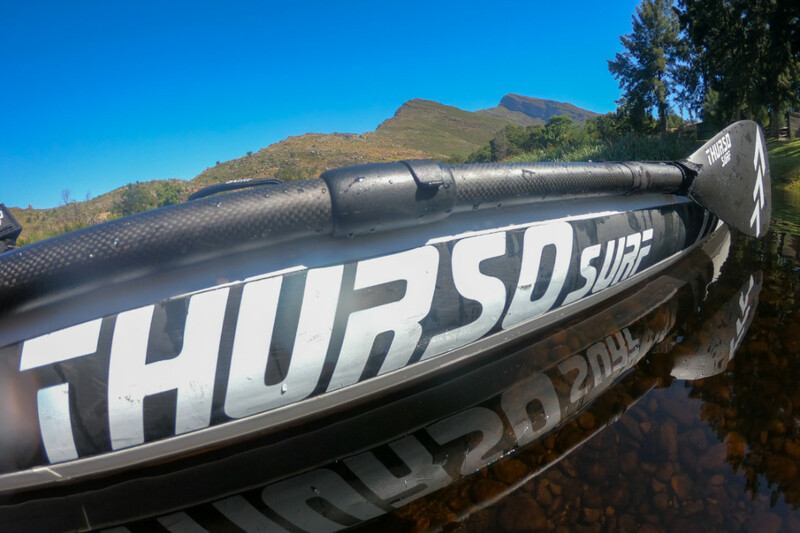 It’s extremely stable and forgiving in all water conditions plus it glides effortlessly on longer trips. The Waterwalker comes in 126 (10’6) and 132 (11′) lengths. Taking the Prodigy, Waterwalker 132, and the Waterwalker 126, out for a float. Our boards are known for their distinctive wood deck graphics and we’ve carried on that tradition with awesome updates to the Waterwalker for 2019! Now you can choose between the Waterwalker 126 with turquoise accents and the Waterwalker 132’s sienna racing stripes. We’ve seen all kinds of gear stuffed in the rigging from footwear and PFDs to doggie toys and even massive coolers tied down to the D-rings. To give you more options and carrying capacity we increased the front rigging to a new 6-point system on the nose, added an all-new 4-point system to the tail and made sure there are 4 additional D rings at the center for sweet add-ons like a kayak seat. 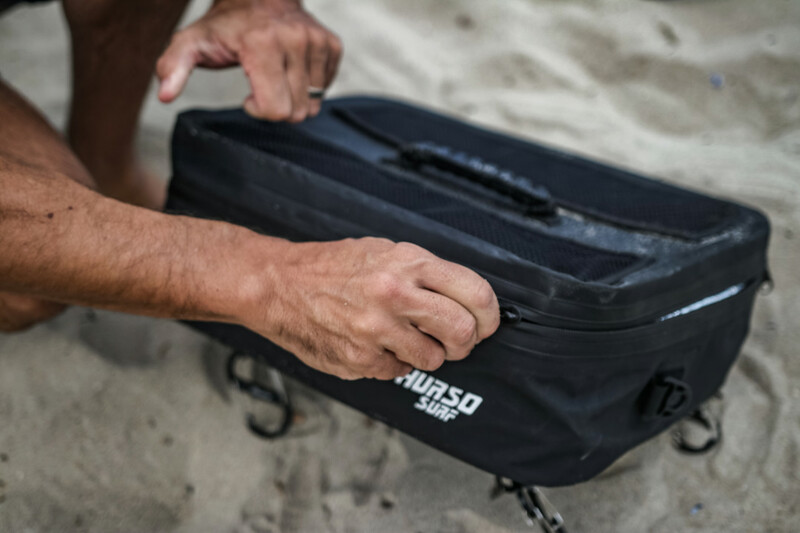 Now you can attach our updated Thurso Surf PVC Deck Bag front and rear (FREE when you pre-order any full-sized board). With a total of 15 D-rings on deck, you’re free to get creative lashing down your gear for fun, for fishing and for longer trips. Now more than ever, Waterwalker is officially adventure ready! When it’s time to put your paddle aside you’ve got plenty of rigging options, but to make it even easier to clear the deck, practice yoga and fitness, or get down to the water hands free, we’ve added paddle holder loops that were a big hit on our Tranquility and Expedition SUPs to the Waterwalker too. Now you can secure your paddle on or off the water with ease. Getting in and out of the water is key to a great adventure so the Waterwalker now comes with three comfort grip grab handles, front, rear and center so your board is always easy to manage and never out of reach. The Expedition’s streamlined touring shape is designed to carve through the water effortlessly when you need to go fast and far. It’s the perfect board for maxing out your speed or for taking longer trips. At 11’6” its the longest board in our lineup and the best choice if you want to cut through the chop or paddle further down the coast. Heading out with the Expedition touring SUP in Cape Town. The Expedition retains it’s connection with our signature wood deck graphics but with with the clean black and white graphic treatment for 2019, it truly stands out on land and on the water. When you’re prepping for an expedition you need options! With its huge displacement and the ability to carry up to 450lbs, you can really put our updated rigging systems to the test on the Expedition. Like the Waterwalker, the nose now features a 6-point system and the tail gets its own 4-point system to take advantage of. 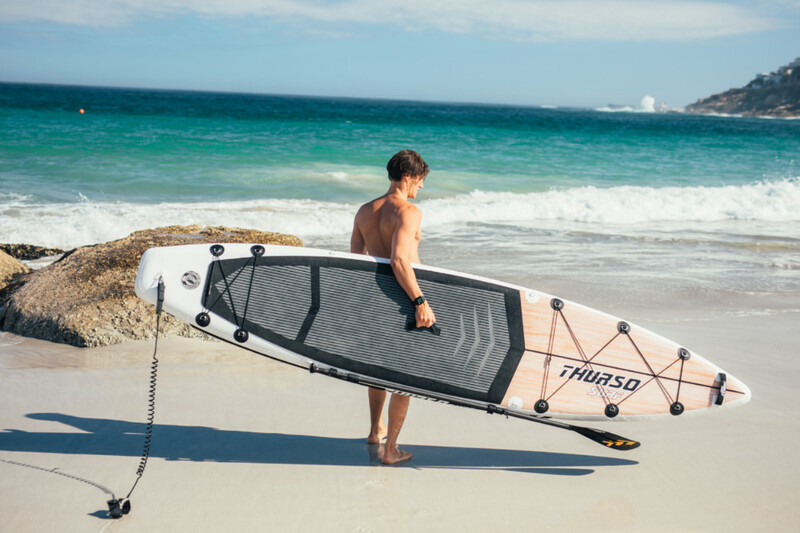 4 central D rings give you the option of attaching a large cooler or kayak seat and our updated Thurso Surf PVC Deck Bag (FREE when you pre-order any full-sized board) attaches front or rear. With a total of 15 D-rings on deck, you’ll be ready for any expedition or overnight trip. The only limit is your creativity! We can’t wait to see how you gear up to get out on the water! The Expedition already comes standard with paddle holders, we’ve also included two comfort grip grab handles, front, and center so your board is always easy to manage and never out of reach. Images of the Expedition prototype on the site currently feature a black and gray deck pad, but production models including pre-order boards will have a more foot friendly black and white deck pad which will stay cool and comfy even over long distances. The Tranquility’s wide body and contoured nose and tail shape make it our most stable platform for on water yoga and fitness activities. Whether you’re paddling or practicing yoga, you’ll be too comfortable for ripples to shake your concentration. Practicing yoga on the Tranquility Yoga SUP. The Tranquility features with bamboo deck graphics along the length of the board, tranquility blue bumper accents, and its signature lotus flower graphic on the nose. We’ve seen some super impressive poses executed on all of our boards but at 82’’ x 30’’, the Tranquility’s striped deck pad gives you all the room you need to practice. EVA foam ensures that genuine yoga mat feel in an extra-long, extra-wide size for the ultimate in stability on the water. The striped channels allow excess water to flow off the mat surface to provide you with extra traction and grip whether you’re practicing your poses or paddling out. When it’s time to practice your poses, you need your paddle to stay put. For that reason, we’ve included a paddle holders standard on Tranquility since day one. In addition, the deck pad features, not one but two offset handles. This gives you room to lie down comfortably through the center line of the board for maximum comfort and concentration. Junior boards may come at a more affordable price, but that doesn’t mean they should skimp on stability or safety! Our Junior boards are made to the exact same bomb-proof construction standards as our full-sized models. 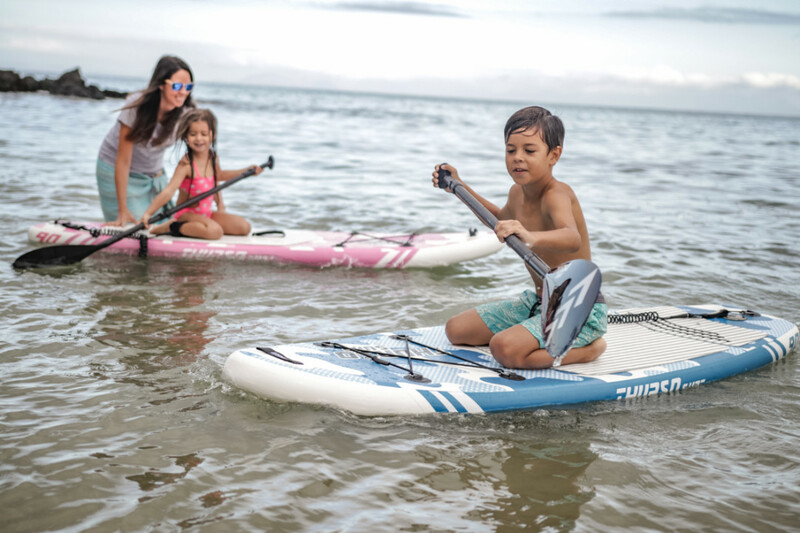 And just like our adult boards, they include our quick-lock toolless 3-fin system so kids can take advantage of the extra stability of a 3-fin setup or benefit from the lengthened glide and tracking of a single fin setup, just like mom or dad. Getting started on the Prodigy junior boards in pink and blue. The Prodigy Junior board is a hybrid shape with a wide-body for the extra stability new paddlers need, and a contoured nose that’s highly maneuverable like our all-round board, the Waterwalker. The Prodigy comes in 2 bright new color-ways in the 7’6” length, blue and pink camo print. The Prodigy comes with a 4-point rigging system on the nose and 2 comfortable grab handles. Our drop-stitched construction and top engineering has always employed the highest standards on the market for bomb proof and durability and unsurpassed safety on the water. Our lightweight, ding-proof boards perform just like hard boards at the recommended PSI making it a no-brainer for us to offer a best in class 2-year warranty, that’s double the standard in the industry. On top of all that, we’ve reinforced the rails on all of our boards so they’re even sturdier than ever! Reinforced rails with our full Carbon Elite paddle. In 2018 you, the Thurso Surf Crew, put our board bags to the test. You took them everywhere from trips on the Tokyo subway to long hikes at elevation to some of the most spectacular paddle destinations we’ve ever seen the world over! 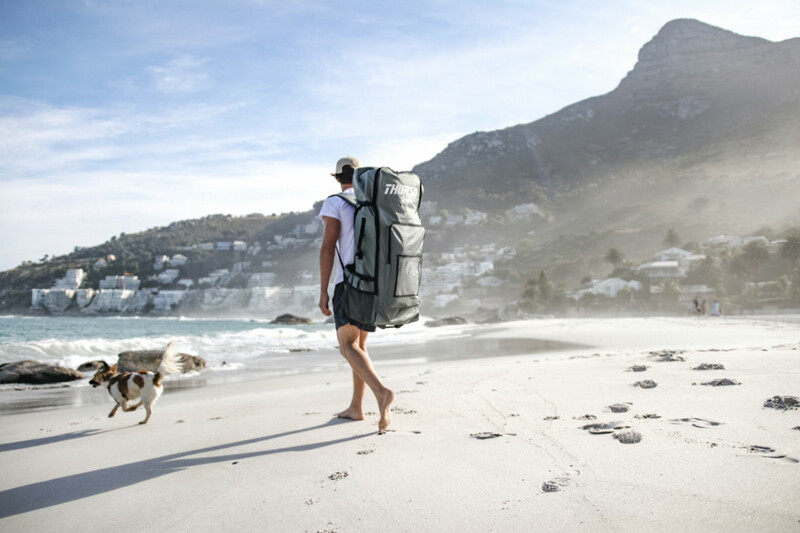 To make it even easier to get from the car to the creek, from the pickup bed to the airport, or to wherever the trail leads you, we’ve upgraded our board bag with thicker padded shoulder straps, a more ergonomic design and a sweet set of rugged wheels. Now you can backpack or roll up on your paddle adventures more comfortably than ever! Our upgraded wheeled board bag comes with all of our full-sized SUP packages. On top of those sweet rigging upgrades, all of our boards and deck bags are compatible with the new Shoulder Strap to make it easier than ever to get down to the water in comfort. 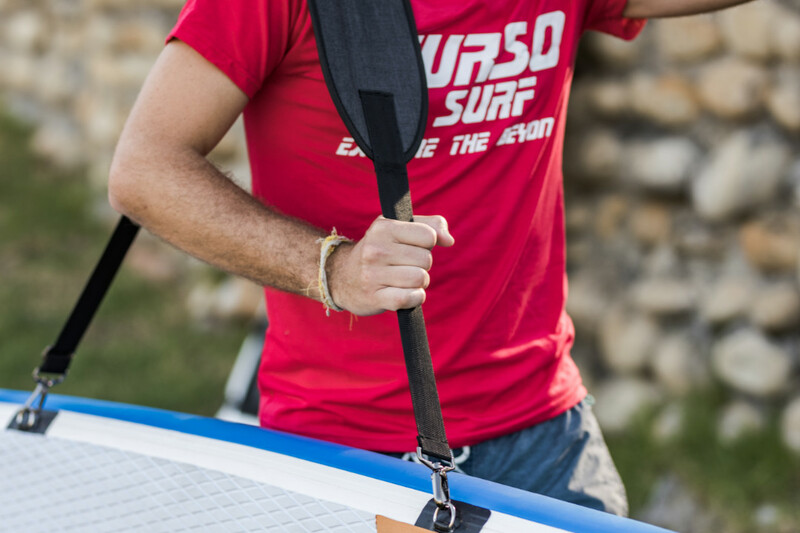 This way, if you’d prefer not to leave your all-new Wheeled Board Bag unattended on shore, you can wear the foldable shoulder strap down to the water and easily tuckit under under the rigging when you’re ready to paddle out. The new Shoulder Strap, compatible with the PVC Deck Bag and all boards is coming soon! Our already awesome carbon shaft paddles just got even better! We include a carbon shaft paddle standard because they’re far superior to the aluminum or fiberglass models you’ll find in most SUP packages. At only 2 pounds, they take the stress and strain away from your shoulders and neck making it much easier to paddle far and fast. They’re also fully adjustable from 68’’ to 84’’ and they even float on water! For 2019 our new locking shaft mechanism means you can swap the handle grip for another paddle blade. That’ll transform your SUP paddle into a kayak paddle with just the addition of a second blade. Nylon and carbon kayak blade options will be available later this spring. Now you can use the ultra lightweight carbon shaft you already have, save on buying a whole separate kayak paddle, and have more space in your board bag! All the 2019 boards come with our new Kayak Blade compatible carbon shafts! Don’t forget, when you pre-order now you’ll get a sweet PVC Deck Cooler Bag FREE ($90 value) while supplies last! It’s the best way to keep up to 20-canned drinks insulated and ice-cold on single or multi-day excursions. Or you can take advantage of its waterproof construction to keep your gear dry! There’s even a separate waterproof case to keep your cellphone or other valuables like your wallet and keys safe even under water. Check out the PVC Deck Cooler Bag in action. That’s all the gear available for pre-order now but we’ve got EVEN MORE awesome stuff planned for 2019! Make sure you’re signed up to the newsletter to get the latest on new gear, community news and exclusive deals!